I just came in here to say I aprove of the beer in the photo. You’re: contraction of you are. e.g. You’re going to stop mixing up your and you’re. 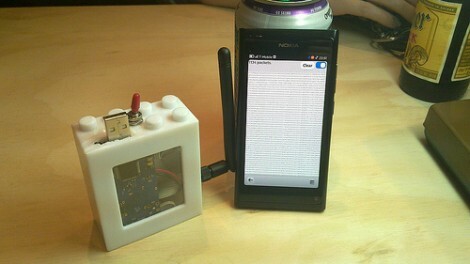 If you’re going to use a Smartphone for display, just use the smartphone to sniff the wifi signals. As the commercials say: “There’s an app for that”. Lots and lots of apps actually. Yup, and a few of them are actually worth using. He isn’t sniffing WiFi, he’s sniffing ZigBee. While they might both occupy 2.5GHz, they are very different protocols. well this is not ZigBee wardriving it’s 802.15.4 wardriving (PHY + MAC Frames) … as far as I understand the GoodFET firmware. ZigBee (PRO) is a network + application layer which sits ontop of 802.15.4 but it cleary is not 802.15.4. There are many other protocols like WirelessHart or 6LoWPAN and a endless propritary variants which use the IEEE 802.15.4 standard. So to detect if a network is ZigBee PRO or something else furter analysing of the MAC Frames must be done, otherwise it’s only a 802.15.4 detector. Someone has been hacking any new computers in my home before even having the net. They use DNA spoofing,arp poisoning and either Evilgrade, Myth Ubuntu or Microsoft media centre itv to send some fm signal either by a satellite dish or strong fm antenna to install things on my computers without even being on the net. My question is some remote hacker has a device that can install remote control code like Terdo tunneling or RAS asynchronous adapter in Windows 7 or XP. How is this possible to hit my computer remotely without the Internet plugged in and how can I stop them from preventing me to load Windows in my home for the last 8 weeks. Can the hacker add software to an external USB hard drive to use my LCD TV to do this? I sure would like this to stop S I am getting married in 4 months and it has brought me a lot of stress. Do you know a great anti-hacker I am willing to pay to sniff this idiot out? Thanks!